1. Watch video or listen to podcast "Pretense, Putdowns and Posing"
2 Read the article "Pretense, Putdowns and Missing Identities in Activists' Class Talk"
3. Watch short animated video "Class Speech Differences"
Print out handout called “Noticing Class Speech-Style Differences” and fold it so only the top half shows. Look at two quotes from members of the same group; what differences do you notice? Then read their class stories. Discuss. Discuss the language style of social justice organizations you support. For example, look at the vocabulary in their mission statements. Does it include the best of both class speech codes? Discuss the article / interview video on pretense and posing. Have you ever seen privilege used as a putdown? Have you ever met activists who pretend to be a working-class or poor person when they’re not? Why does the author advocate open talk of class identities? 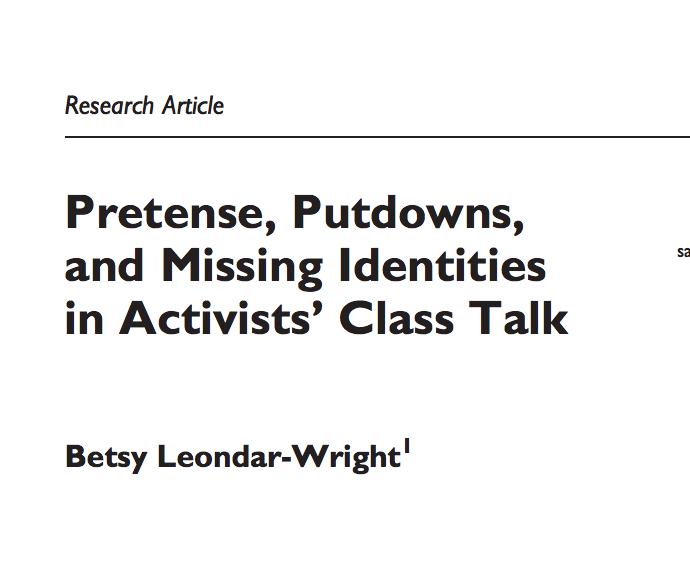 Read the article: "Pretense, Putdowns and Missing Identities in Activists' Class Talk"